The RSPB’s investigations unit doesn’t just deal with dead birds – sometimes our role is to prevent crimes being committed in the first place by operating species protection schemes. Last week the surprise arrival of seven bee-eaters provided a colourful interlude to our usual routine. The magnificent, multicoloured seven turned up at East Leake CEMEX Quarry, near Loughborough, on 25 June and quickly began to draw a crowd. As with the last few times bee-eaters have shown up, we knew we needed to act. With word spreading quickly on Twitter, and working with our business partners CEMEX UK, a plan was put in place to protect the colony and make sure no-one wandered into the active quarry. After speaking to a local farmer, we’d soon secured a nearby field for parking. Road signs were ordered. A Twitter shout-out later and we’d appointed volunteers to marshal the car park and point the way to the best viewing spot, and two wardens to protect the birds for the duration of their stay. 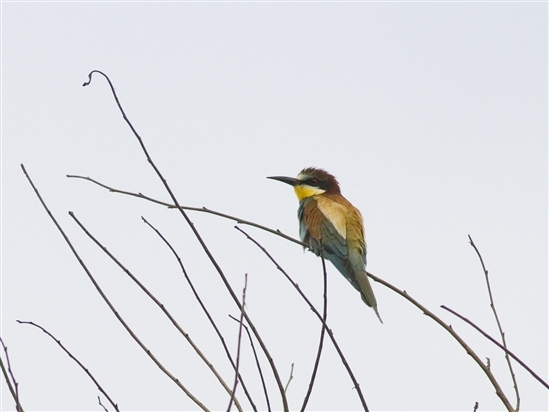 Bee-eaters are Schedule 1 birds, giving them the maximum level of legal protection and meaning anyone who disturbs them – or worse – could face jail. Hopefully our efforts would simply make it safe and easy for people to enjoy the sight of these spectacular birds. Two days later, on Wednesday, I hopped in the car from the Lodge in Sandy to see how the viewing scheme was shaping up – and to get my first ever look at a bee-eater. It was a distinctly British summer’s day, by which I mean grey and cold, making the birds stand out even more vibrantly: little rainbows against a cloudy sky. I heard them first, calling from an ash tree, then saw small shapes flit between the top-most branches. A lady with a scope offered me a closer look, and I broke into a smile. There were three sitting together, taking turns to dart up and catch bees and butterflies, which they’d toss into the air before catching them again in their blade-like beaks. Playing with your food, to disable the sting, is essential if you’re a bee-eater. 'Plan B' has proved a great example of people working together to safeguard wildlife and encourage people's enjoyment of it. We had a chat with the farmer (who turned up in his muddy Landrover having just been to calve a cow) and he was delighted with the birds’ arrival, and happy to host rows of cars on his land. A huge thanks also goes to CEMEX, who have enabled thousands of people to see the birds and helped keep both birds and people safe. And @NottsBirders have been great in creating a ‘buzz’ (sorry) on social media. 2500 people came to see the bee-eaters over the weekend, and we expect the birds to be around for at least a month more. Details of how to visit below. How to see the bee-eaters: Follow your sat nav to LE12 6RG. Car park open 6am-9pm at a cost of £5 (half of which goes straight back to the RSPB to help us protect the wildlife you love).